the script for Toon Boom Harmony that makes swapping drawings easier. You can download the QuickSwap script for Toon Boom Harmony here. What is the best minimum drawing size when using native thumbnails? 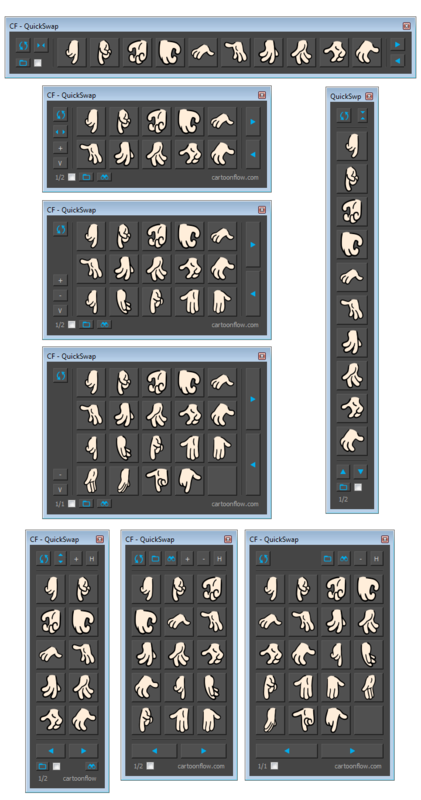 QuickSwap is a free script for Toon Boom Harmony making swapping drawing substitutions like hands or mouths (for lip syncing) easier. 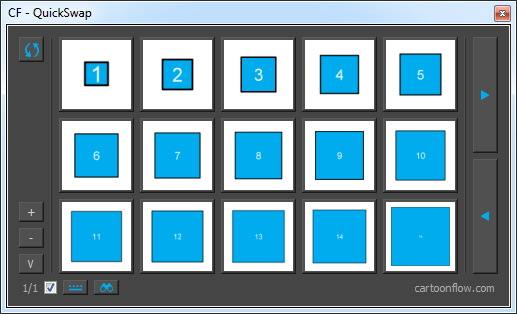 It allows you to display up to 20 substitution images of your drawing library all at once. And this in several different ways. How to use the QuickSwap script? Select a drawing layer and click on the 'Load' button. You're done, the buttons will display the thumbnails of the layer's substitution images. Now, you can directly swap to the drawing substitution that you want by picking it from the QuickSwap view. If you are making cut-out animation in Toon Boom Harmony, QuickSwap will speed up your workflow and will especially make the lip sync process more comfortable. QuickSwap will only display the thumbnails of the SAVED drawings. So, before loading or reloading the drawing substitution images, don't forget to save your scene in order to be sure to see the thumbnails show the latest version of your drawings. QuickSwap is able to display 2 different types of thumbnails. Tumbnails of the first type are created via QuickSwap every time the user clicks on the the "Load Drawings" button and the "Display existing native thumbnails" checkbox is unticked. Unfortunately, these images can't show drawing elements of the Overlay and Underlay layers. These thumbnails have a tranparent background. Thumbnails of the second type are the thumbnails that are created by Harmony. These are the thumbnails that Harmony displays in the "Substitution Library" view and which it uses for the the timeline thumbnails introduced in Harmony 15. In order to display native Harmony thumbnails tick the "Display existing native thumbnails" checkbox. The background colour of these thumbnails is white . The answer to this question depends on your priorities and on your usage of Overlay and Underlay layers. In order to decide which thumbnail type to use have a look at the following list of the pros and cons of each thumbnail type. 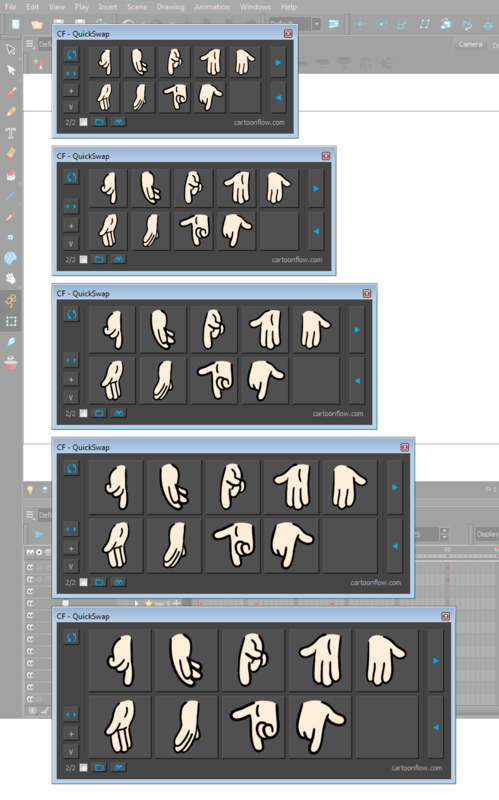 Thumnails must be recreated by QuickSwap every time the drawing is reloaded by the script. This makes the process a bit slower. Displayed button thumbnails may be very small for small drawings*. * An interesting background information: Thumbnails generated for templates from the library view are cropped to the size of the drawing!!!!! But we unfortunatly cannot benefit from that here. If your drawings were created in Harmony 15 their native thumbnails will be displayed on the QuickSwap buttons witout any problem. If your drawings were created in a previous version of Harmony, the displayed result might look like this. Harmony 15 creates a new thumbnail image once a drawing is created or modified and updates it at latest when the scene file is saved. The program will create or update the tumbnails it at latest when the scene file is saved. 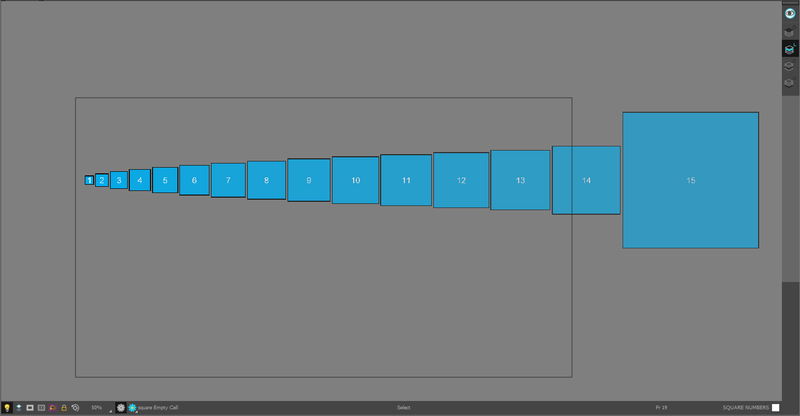 in the timeline when the drawing layer is set to timeline thumbnails mode. Previous versions of Harmony 15 didn't create thumbnails in this sytematic way. That's why images created in an older version may not have their corresponding native thumbnail yet. 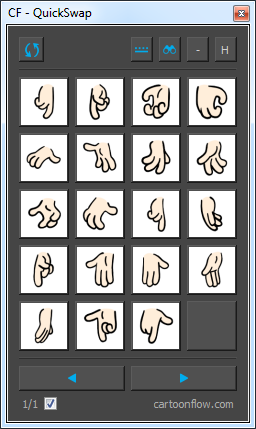 In order to create the thumbnails for these substitution drawings and to make them available for QuickSwap, these drawings must be exposed at least once in the current scene. Display temporarely the timeline thumbnails of the layers or use the "Show/Hide All Thumbnails" button in the Layers toolbar of the Timeline view. Browse and pan through your timeline to make sure that the timeline thumbnails of your targeted layers are displayed at least temporarely in the visible area of the timeline. When you reload the image to QuickSwap (by clicking the 'Load Drawings' button) the thumbnails will be displayed properly. 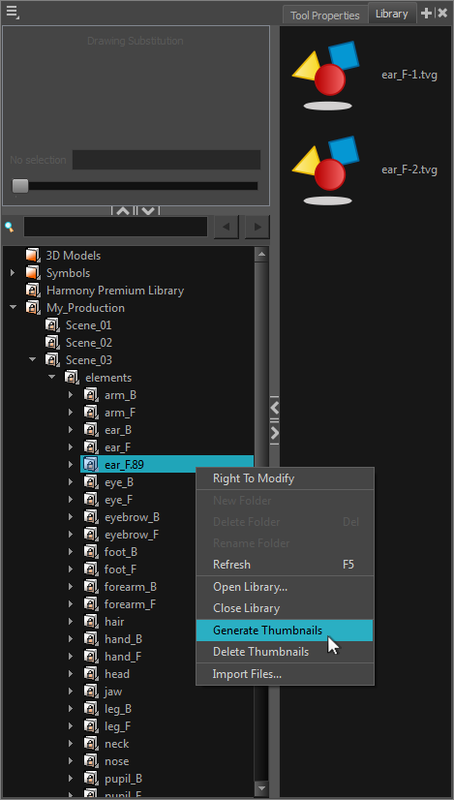 These steps are necessary at the moment when you migrate your scene from an older version of Harmony to Harmony 15. They also may become usefull when you have changed a drawing without the image being displayed in the 'Substitution Library' or as a timeline thumbnail. When saving the file, Harmony 15 creates and updates the thumbnails of every drawing created or modified in the scene. So, you won't have to manually create any other drawing thumbnails for this scene very often later. This would help to get rid of the previously described manual steps. Unfortunately, by default, QuickSwap will only be able to preview the Line Art and Colour Art layers of your drawings. Overlay and Underlay layers can't be accessed that way via scripting. Thumbnails generated directly via Toon Boom Hamony contain the Overlay and Underlay layers. 1. Generate these thumbnails from the library explorer by right-clicking on the drawing's folder and selecting 'Generate Thumbnails' in the drop down menu. Alternatively, you can also select 'Refresh' or hit 'F5'. 2. Hit the 'Load' button as usual. 3. Tick the checkbox to replace QuickSwap's thumbnails with those generated via the library explorer. Let's take as an example a drawing layer with 15 substitution drawings of a growing square. We can see that the thumbnails of the drawings before image number 8 don't use the maximum surface of the button. Whereas the thumbnails of the following drawings don't get considerably larger than the one of image number 8. So, we can conclude that if you want to be sure that your drawing thumbnail will make a good use of the button surface, your drawing should not be smaller than drawing number 8. You can download the Harmony file of the example here (Harmony 14 & 15). Be sure to use a consistent number of digits when numbering images of a contiguous set of images. In other words, fill empty spaces with zeros. E.g., a set of happy mouth images that are named 'happy_01', 'happy_02', ..., 'happy_10' will be displayed in the right order. The 'Zoom' function allows you to display the thumbnails at a bigger size. Once you've loaded the drawing substitutions of a layer, you'll be able to swap that layer's images, even when you have selected another one. You can open the script several times which allows you to swap the drawings of different layers in parallel. - bugfix: there still was an issue with Sync Layers. Now, the script displays properly the thumbnails of the selected Sync Layer. The QuickSwap script should run in the versions 10, 11, 12, 14 and 15 of Toon Boom Harmony. It works in Offline (Stand Alone) and Online mode (when working with Harmony Server). Many thanks to William Saito for his website www.toonboomscripts.com and the scripts he provides there. His website is one of the rare places in the under-developed world additional scripts for Toon Boom Harmony. A piece of QuickSwap's code (the one allowing to place all resource files into the same directory) is based on William's script Selection Sets 2.0.